"The need for meat. It is an extreme ecstasy derived from eating it." We've had plenty of cannibal films over the years, from the truly infamous (Cannibal Holocaust) to the clever (Ravenous), with zombie movies as a related genre, I suppose. 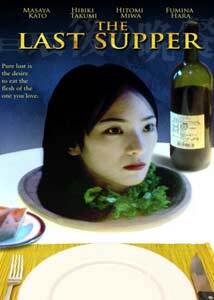 One of the more recent entries in the field is Osamu Fujitani's The Last Supper (Saigo no bansan), adapted from a novel by author Kei Ohishi. The movie and DVD both slot in as mediocre entries, the film doing little to stand out from any other Asian horror film out there. Dr. Yuji Kotorida (Masaya Kato) is a suave dude; he's a good-looking plastic surgeon who also happens to have a way with the ladies, and he can cook. Naturally, having seen him behead a woman first thing in, we can guess what makes him fire up the grill. It turns out that he was a schlub, a loser who was given his position in a plastic surgery practice in sympathy for how lousy he was. One day, having done a liposuction job, he decides that he just needs to try some of that fat he's just extracted. Is this gross enough for you yet? Well, director Fukutani lovingly films the sizzling fat as Kotorida fries it up and chows down. Unsurprisingly, he finds the fat rather unappealing, but he can tell he's on the right track. And when he discovers the body of a female hanging victim, it's like a gift from above. From there, it's only a matter of time before he's writing an anonymous online journal discussing his lifestyle and fending off possible discovery. This film exists, like a lot of recent horror fare, only to disgust its audience. The script is too muddled to find much subtext, with the introduction of a cannibal cop (Hiroki Matuskata) only further fouling a messy stew. Like Ravenous, this film presents cannibalism as the secret means by which daring souls can drastically improve their health and standing in society, the idea presumably being that we must literally eat our enemies to win. The best bit in the film involves Kotorida's trip to Hong Kong for a conference, which finds him spending downtime hunting out possible sources of fresh meat in the streets, and stumbling upon a secret cannibal underground, with its own "dishes of the day" as in Hitchhiker's Guide to the Galaxy. The film opens with what turns out to be a nonsensical credit sequence using Christian iconography that plays off the title in some inexplicable way, since the film never vaguely relates anything to it. Obviously, Catholicism invokes cannibalism when Jesus gets into the whole transubstantiation thing at the original last supper, but what that has to do with anything in this film escapes me. Or it could be that it simply isn't worth thinking about. This really does seem slapped together, with an ending that more or less just happens, without any worthwhile foreshadowing. The final shot does leave the possibility of a sequel open, but I can't imagine anyone caring one way or the other. Image Transfer Review: Presented in nonanamorphic letterbox format, the picture looks okay in terms of color, but often displays problems with image noise and occasional artifacting. Not terrible, but far from great. The optional English subtitles (Spanish also available) are fine. Audio Transfer Review: The soundtrack seemed a little out of balance, with loud sections too loud and soft sections too soft. Otherwise, dialogue was clear and understandble. Viewers have the choice between a truly terrible English dub and the original Japanese dialogue. If you want to approach the movie as pure cheese, go for the English track. Extras Review: Just the trailer, though the packaging lists two versions of the film, one with English dialogue, and one with Japanese, as if switching between the audio is a special feature. Gore lovers will probably be disappointed by this film, as it doesn't feature excessive over the top blood and guts, and most others will likely be revolted enough by the premise to steer clear. Basically, there are better cannibal films out there, if you are so inclined, and there isn't enough here otherwise to recommend watching.